I was so lucky that the first participating outlet that I visited is such an unexpected gem! The Tryst Cafe, located in SS15 Subang Jaya is a very charming and comfortable place to chill with friends, especially over the weekends. I fell in love with it's overall feel as soon as I stepped inside the cafe albeit feeling a bit cold due to the air conditioner working at full blast (I was having a flu). 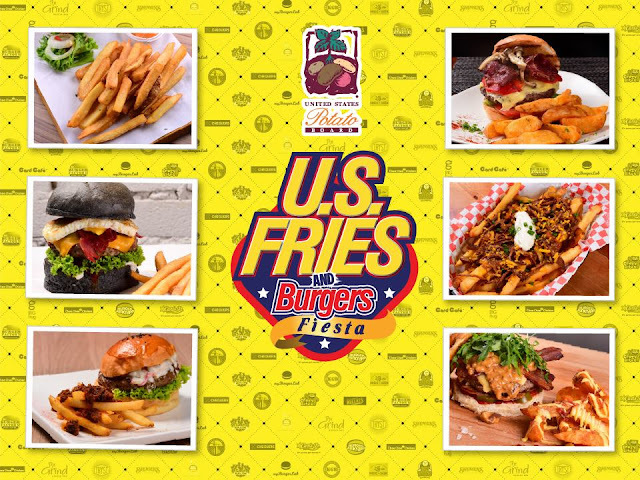 For the U.S Fries & Burgers Fiesta, Tryst Cafe has curated two different menus which are the Cheese and Potatoes Wedges and also the Pancake Chicken Burger. While waiting for the two to be ready, we couldn't help ourselves from trying their wide arrays of beverages in the menu like hot coffees, cold drip, and hot teas. I was really loving the hot Egyptian tea they served us. *Sorry can't remember it's full name* Loved the taste of the coffee too. We were busy chatting away with the cafe owner so the time flies by so fast. Our foods were ready to serve before we even know it. But as soon as the plates touches out table, I started to feel very impatient. My stomach was grumbling so badly since I didn't had any lunch before the session. LOL. It was then the time to dig in and lay out our personal verdict on both menu. Fries and cheese? This is the ultimate comfort food. Who doesn't love their combination right? The wedges tasted even more splendid when served during a relaxing weekend evening (especially if it's raining) #heaven. Crispy on the outside and soft on the inside, U.S potatoes definitely delivers the best snacking experience. The gratin is topped with melt cheddar cheese (yummy!) and mayonnaise (double yummy!) to give a nice balance on the flavouring. And did I mention that they were piping hot when first served to us? Just awesome! Share it with friends or your date over a nice cup of coffee or tea while catching up on life. It will definitely be a worthy meetup. A bowl of them is very fulfilling so you can even consider it as a full meal. After a certain accident in another cafe, I never really like to order any pancake burger anymore.So, I was a teeny bit worried when I first learned that the second menu from Tryst Cafe would be a fusion between a pancake and a burger. Wonder why? 1. Pancakes dough are usually sweet. Combining with the savoury and heavy taste of chicken meat and all the sauces, if you fail to balance it well it could ended up badly. Like overly sweet burger? Urgh please, no. 2. Wrong rationing on the batter can make the pancake to turn dense. Heavy taste on both the pancake and the burger ingredients would be disastrous as people will get bored of the taste really quickly. Thankfully, my paranoia was unprecedented. The Tryst Cafe Pancake Chicken Burger was executed so perfectly, I ended up eating more than everyone else! *guilty as charged* I am not overstating it, their homemade pancake was well made. Bravo! It was so soft, fluffy and not too sweet! Not heavy nor dense at all. I managed to asked the cafe owner about their homemade mix and he explained that they managed to find the suitable balance between the pancake and the burger ingredients after a few sets of trial and error. The juicy chicken patty, sandwich with coleslaw and U.S potato wedges that are served together with the pancake made it even better. The patty was juicy and tender; not dry nor overcooked. So if you're looking for a nice place to chill in the upcoming weekend, you might want to check out Tryst Cafe SS15 special menu for 2016 U.S Fries & Burgers Fiesta! Psstt.. if you're the type who love to Instagram your cafe hopping journey, make sure to join the ongoing Instagram contest too! 3 winners with the best pictures of them enjoying the promotion US fries and burgers will win RM150 cash prizes weekly. All you have to do is send your picture of #USFries&BurgerFiesta. *This is a sponsored post but all the experience sharing are based on my own thoughts.